Greenland ( Greenlandic: Kalaallit Nunaat, pronounced [kalaːɬit nunaːt]; Danish: Grønland, pronounced [ˈɡʁɶnˌlanˀ]) is an autonomous constituent country of the Kingdom of Denmark between the Arctic and Atlantic oceans, east of the Canadian Arctic Archipelago. 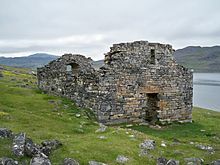 Though physiographically a part of the continent of North America, Greenland has been politically and culturally associated with Europe (specifically Norway and Denmark, the colonial powers, as well as the nearby island of Iceland) for more than a millennium. The majority of its residents are Inuit, whose ancestors began migrating from the Canadian mainland in the 13th century, gradually settling across the island. 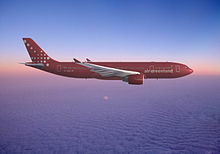 Greenland is the world's largest island ( Australia and Antarctica, both larger than Greenland, are generally considered to be continental landmasses rather than islands). Three-quarters of Greenland is covered by the only permanent ice sheet outside Antarctica. With a population of about 56,480 (2013),  it is the least densely populated territory in the world. 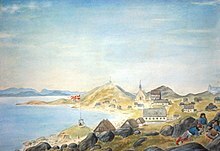 About a third of the population live in Nuuk, the capital and largest city. The Arctic Umiaq Line ferry acts as a lifeline for western Greenland, connecting the various cities and settlements. The average daily temperature of Nuuk, Greenland varies over the seasons from −8 to 7 °C (18 to 45 °F). The total area of Greenland is 2,166,086 km2 (836,330 sq mi) (including other offshore minor islands), of which the Greenland ice sheet covers 1,755,637 km2 (677,855 sq mi) (81%) and has a volume of approximately 2,850,000 km3 (680,000 cu mi). The highest point on Greenland is Gunnbjørn Fjeld at 3,700 m (12,139 ft) of the Watkins Range ( East Greenland mountain range). The majority of Greenland, however, is less than 1,500 m (4,921 ft) in elevation. Phytogeographically, Greenland belongs to the Arctic province of the Circumboreal Region within the Boreal Kingdom. The island is sparsely populated in vegetation; plant life consists mainly of grassland and small shrubs, which are regularly grazed by livestock. The most common tree native to Greenland is the European white birch ( Betula pubescens) along with gray-leaf willow ( Salix glauca), rowan ( Sorbus aucuparia), common juniper ( Juniperus communis) and other smaller trees, mainly willows. Greenland's flora consists of about 500 species of "higher" plants, i.e. flowering plants, ferns, horsetails and lycopodiophyta. Of the other groups, the lichens are the most diverse, with about 950 species; there are 600-700 species of fungi; mosses and bryophytes are also found. Most of Greenland's higher plants have circumpolar[ disambiguation needed] or circumboreal distributions; only a dozen species of saxifrage and hawkweed are endemic. A few plant species were introduced by the Norsemen, such as cow vetch. The party system is dominated by the social-democratic Forward Party, and the democratic socialist Inuit Community Party, both of which broadly argue for greater independence from Denmark. 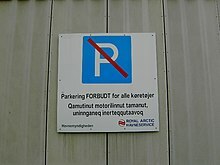 While the 2009 election saw the unionist—and largely Danish— Democrat Party (2 MPs) decline greatly, the 2013 election consolidated the power of the two main parties at the expense of the smaller groups, and saw the eco-socialist Inuit Party elected to the Parliament for the first time. The dominance of the Forward and Inuit Community parties began to wane after the snap 2014 elections, and 2018 elections. Formerly consisting of three counties comprising a total of 18 municipalities, Greenland abolished these in 2009 and has since been divided into large territories known as "municipalities" ( Greenlandic: kommuneqarfiit, Danish: kommuner): Sermersooq ("Much Ice") around the capital Nuuk and also including all East Coast communities; Kujalleq ("South") around Cape Farewell; Qeqqata ("Centre") north of the capital along the Davis Strait; Qeqertalik ("The one with islands") surrounding Disko Bay; and Avannaata ("Northern") in the northwest; the latter two having come into being as a result of the Qaasuitsup municipality, one of the original four, being partitioned in 2018. 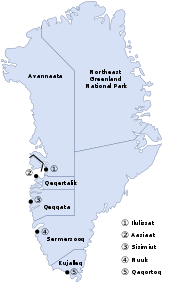 The northeast of the island composes the unincorporated Northeast Greenland National Park. Thule Air Base is also unincorporated, an enclave within Avannaata municipality administered by the United States Air Force. During its construction, there were as many as 12,000 American residents but in recent years the number has been below 1,000. Greenland is abundant in minerals. Mining of ruby deposits began in 2007. Other mineral prospects are improving as prices are increasing. These include iron, uranium, aluminium, nickel, platinum, tungsten, titanium, and copper. Despite resumption[ when?] of several hydrocarbon and mineral exploration activities, it will take several years before hydrocarbon production can materialize. The state oil company Nunaoil was created to help develop the hydrocarbon industry in Greenland. The state company Nunamineral has been launched on the Copenhagen Stock Exchange to raise more capital to increase the production of gold, started in 2007. Greenland suffered an economic contraction in the early 1990s. But, since 1993, the economy has improved. The Greenland Home Rule Government (GHRG) has pursued a tight fiscal policy since the late 1980s, which has helped create surpluses in the public budget and low inflation. Since 1990, Greenland has registered a foreign-trade deficit following the closure of the last remaining lead and zinc mine that year. More recently,[ when?] new sources of ruby in Greenland have been discovered, promising to bring new industry and a new export from the country. (See Gemstone industry in Greenland). Greenland has a population of 56,370 (January 2013 estimate),  of whom 88% are Greenlandic Inuit (including Danish- Inuit mixed). The remaining 12% of people are of European descent, mainly Greenland Danes. Several thousand Greenlandic Inuit reside in the Danish Peninsula. The majority of the population is Lutheran. Nearly all Greenlanders live along the fjords in the south-west of the main island, which has a relatively mild climate. More than 17,000 people reside in Nuuk, the capital city. ^ a b c (in Danish) TV 2 Nyhederne – "Grønland går over til selvstyre" TV 2 Nyhederne ( TV 2 News) – Ved overgangen til selvstyre, er grønlandsk nu det officielle sprog. Retrieved 22 January 2012. ^ Saillard J, Forster P, Lynnerup N, Bandelt HJ, Nørby S (2000). "mtDNA variation among Greenland Eskimos: the edge of the Beringian expansion". American Journal of Human Genetics. 67 (3): 718–26. doi: 10.1086/303038. PMC 1287530. PMID 10924403. ^ a b Grove, Jonathan (2009). "The place of Greenland in medieval Icelandic saga narrative". Journal of the North Atlantic. 2: 30–51. doi: 10.3721/037.002.s206. Archived from the original on 11 April 2012. ^ Grønnow, B. (1988). "Prehistory in permafrost: Investigations at the Saqqaq site, Qeqertasussuk, Disco Bay, West Greenland". Journal of Danish Archaeology. 7 (1): 24–39. doi: 10.1080/0108464X.1988.10589995. ^ Møbjerg, T. (1999). "New adaptive strategies in the Saqqaq culture of Greenland, c. 1600–1400 BC". World Archaeology. 30 (3): 452–65. doi: 10.1080/00438243.1999.9980423. JSTOR 124963. ^ Rasch, M.; Jensen, J. F. (1997). "Ancient Eskimo dwelling sites and Holocene relative sea‐level changes in southern Disko Bugt, central West Greenland". Polar Research. 16 (2): 101–15. Bibcode: 1997PolRe..16..101R. doi: 10.1111/j.1751-8369.1997.tb00252.x. ^ Rowley, G. (1940). "The Dorset culture of the eastern Arctic". American Anthropologist. 42 (3): 490–99. doi: 10.1525/aa.1940.42.3.02a00080. ^ Alley, R.; Mayewski, P.; Peel, D.; Stauffer, B. (1996). "Twin ice cores from Greenland reveal history of climate change, more". Eos, Transactions American Geophysical Union. 77 (22): 209–10. Bibcode: 1996EOSTr..77R.209A. doi: 10.1029/96EO00142. ^ " Why societies collapse". ABC Science. ^ " Find Greenland Icecap Bridges Three Islands", Ellensburg Daily Record, 24 October 1951, p. 6. Retrieved 13 May 2012. ^ Willerslev, E.; Cappellini, E.; Boomsma, W.; Nielsen, R.; Hebsgaard, M. B.; Brand, T. B.; Hofreiter, M.; Bunce, M.; Poinar, H. N.; Dahl-Jensen, D.; Johnsen, S.; Steffensen, J. P.; Bennike, O.; Schwenninger, J.-L.; Nathan, R.; Armitage, S.; De Hoog, C.-J. ; Alfimov, V.; Christl, M.; Beer, J.; Muscheler, R.; Barker, J.; Sharp, M.; Penkman, K. E. H.; Haile, J.; Taberlet, P.; Gilbert, M. T. P.; Casoli, A.; Campani, E.; Collins, M. J. (2007). "Ancient Biomolecules from Deep Ice Cores Reveal a Forested Southern Greenland". Science. 317 (5834): 111–14. Bibcode: 2007Sci...317..111W. doi: 10.1126/science.1141758. PMC 2694912. PMID 17615355. ^ Aage, H. (2012). "Alcohol in Greenland 1951–2010: consumption, mortality, prices". International Journal of Circumpolar Health. 71: 18444. doi: 10.3402/ijch.v71i0.18444. PMC 3525923. PMID 23256091. ^ Madsen, M. H.; Grønbæk, M.; Bjerregaard, P.; Becker, U. (2005). "Urbanization, migration and alcohol use in a population of Greenland Inuit". International Journal of Circumpolar Health. 64 (3): 234–45. doi: 10.3402/ijch.v64i3.17987. PMID 16050317. Sowa F (2013). "Indigenous Peoples and the Institutionalization of the Convention on Biological Diversity in Greenland". 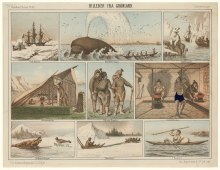 Arctic Anthropology. 50 (1): 72–88. doi: 10.3368/aa.50.1.72.